My friend Ryan and I headed up to lake Superior for the weekend, on yet another one night camping excursion. Before checking in to our camp site at Tettegouche State Park, we headed farther north to check out some water falls. First we stopped at Temperance State Park and hiked the rocky trails along the river. The park is laden with age worn steps, some carved into the rock, others stacked from loose stones. The abundance of trees shed plenty of shade over the various paths and trails. The shallow depth of the soil leaves the roots of many trees visible, snaking around the rocky surface, giving a majestic feel to the already sublime surroundings. With it’s long series of short falls, carving deeper into the bedrock, the Temperance river is a beautiful place to go and spend some time. Clear skies and the bright sun did not make for great photographic conditions though. After a couple of hours wandering the river side, we departed and stopped at a place Ryan’s friend had told him to go. Driving by it on the main road, You would never guess what was lingering just inland from the shore. Nor would You think that You would find anything particularly special once You parked in the small ten car lot. It was another small river, trickling over the rocks in a nearly deserted valley. Such is the way of this part of Minnesota. Every couple of miles is yet another river, stream, or creek, feeding into the vast lake to the south. This particular one however, is a gem among the parks up here. Somehow, it was also the least travelled of the places we went. All of the other parks and falls had tons of people buzzing around the crowded parking lots and river sides. We saw eight people on our hike up this stream. One was panning for gold in the lower part of the river, He told us it was wise to keep going up the path nearby, “so long as we didn’t mind the 158 stairs.” Unsure about what was to come, we hiked up the trail. It went up above the river pretty quickly, after only ten minutes or so, we were at least 75 feet above the valley floor. Then, after a little more hiking, we rounded a bend. The sound was unmistakable. Waterfall. Shortly after hearing it in the distance, the path split, one way went up, the other down. We chose the downward option, discovering a long meandering set of stairs. “This must be what that guy told us about.” Was the thought that passed through My head. At the end of the steps, flowed a gorgeous falls. Pouring into a calm pool, surrounded by a rocky beach and towering cliffs. We stayed for quite a while. Ryan went for a swim while I soaked My feet in the cool water and snapped a ton of pictures. This was My favorite part of the trip… We couldn’t even see the whole falls, because it made a bend or two as it went down. Nor did we hike up to the top, because we lingered so long at it’s base, we had to rush farther south to check in to our camp for the night. Our camp site was at Tettegouche State Park. Having not planned this trip, I simply booked the lone site available on the entire north shore. I could see right away why it was the only site available on the hundreds of miles of coast. This site was ten feet from the trail down to the shore and sadly, most of the people who came up from the shore, walked right through our site, instead of the trail. So it was a high traffic home! My goals for the weekend were to shoot the full moon rising over the lake, shoot some time lapse of the stars at night and some time lapse of something, anything during the day. After mostly clear skies all day, the moon managed to hide behind clouds when it came up. Once Luna was up in the sky, the clouds moved out, but the moon was so bright, it blotted out the stars. It was no darker than an ordinary overcast day, except it was night time. I did manage to shoot a time lapsable sequence during the day, but it was spoiled by people walking by, a lot. So I managed to succeed in none of My goals for the wekend. It was a great time though!! In the end, I just want to move farther north. I’ve been saying this for half of My life time, maybe I should just act on it soon? Clear water, endless forest, massive rock formations, cliffs and rolling hills, waterfalls and an abundance of wild life. The north shore is marvellous. I will be back there as soon as possible. Ten years ago, I discovered this frame on eBay. I wanted a full suspension set up, but had pretty much given up on finding such a frame that wasn’t stupidly heavy for My purposes. 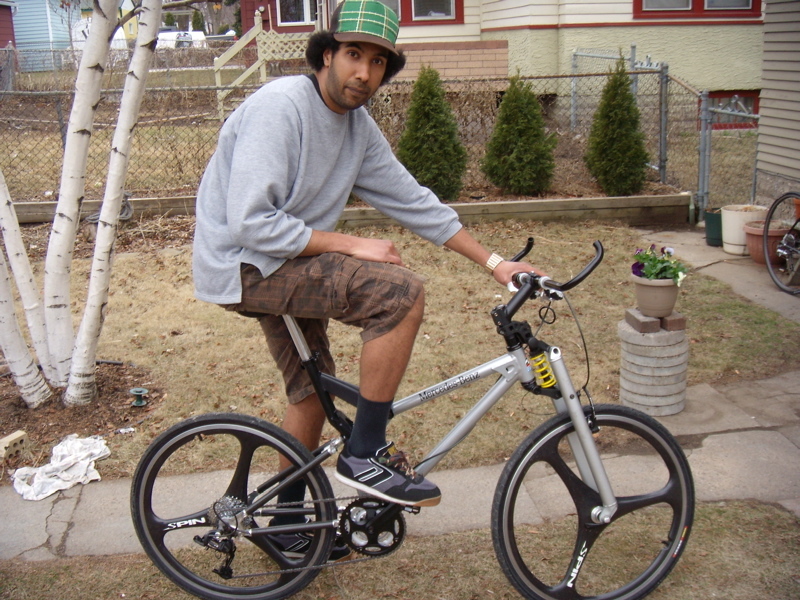 I was looking for a light weight mountain bike frame to build up for riding the city streets. This beauty weighs in at 4.55 pounds, that is the frame, shock and the black seat mount together. It just doesn’t get any better than that, unless You want a rigid frame. It was made by a company called Amp Research, formerly Amplifier, in the late 90’s. Originally, these bikes came with disk brakes, the first bike ever with disk brakes in fact. Though that made for some complications in My build. Now, there are standard mounting points for brake calipers and rotors, but since this was before standards came to being, the only ones that work are the original Amp brakes. Unfortunately Amp Research is an engineering group, that dabbles in many different types of things and at the turn of the century, they ended their decade-long run making bicycles. Needless to say, finding all the hardware, without buying another one of their bikes, whole, was not an easy task. Over the next couple years, I actually bought two more variations of them. This one aquired on auction from a police department in Michigan. Only the frame and fork were from that auction, along with a set of the old Amp disk brakes. These black and white bikes were originally made for the New York police department, amp added the rack to their standard issue Mercedes-branded bikes and sold them to cops around the nation. I love the front fork on this bike. A second generation Amp model, which has a mere two and a half inches of travel, but they are so smooth and absurdly light. This is a B3 series frame set. Which recieved all of the rest of it’s components, less the brakes and wheels, from My old specialized rock hopper. I bought the Vuelta wheels and a set of Shimano IS Hydraulic disk brakes once I figured out an adapter to be able to mount the now standard brakes. Which was a four year hassle that eventually led Me to sell this bike in frustration. The front worked just fine, but the rear brakes were mounted in a pretty shody way. At least I doubled My money on it. 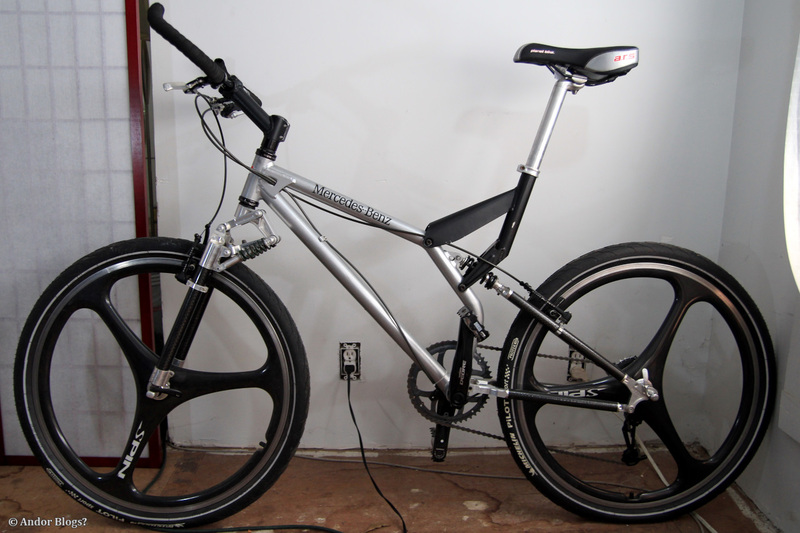 Shortly after selling that bike, I found an Amp F3 front fork, with the carbon fiber pipes, from their last(B5) frame. I proceeded to replace the Girvin Cross-Link Elite that had been on My silver B4 frame for 5 years. This was a welcome change, since the old Girvin fork was nearly twice the weight. Oddly, the carbon fork is actually heavier than the older, all aluminum one. It does have a longer range of travel, but it is not as smooth as the elder fork was either. It does match the carbon rear end of My frame and the bike is much nicer to ride than it was with the cross-link on it. I must admit though, I liked the look with that girvin fork too. I was happy to aquire My third Amp Research bike(not pictured) because it had the v-brake clamps. 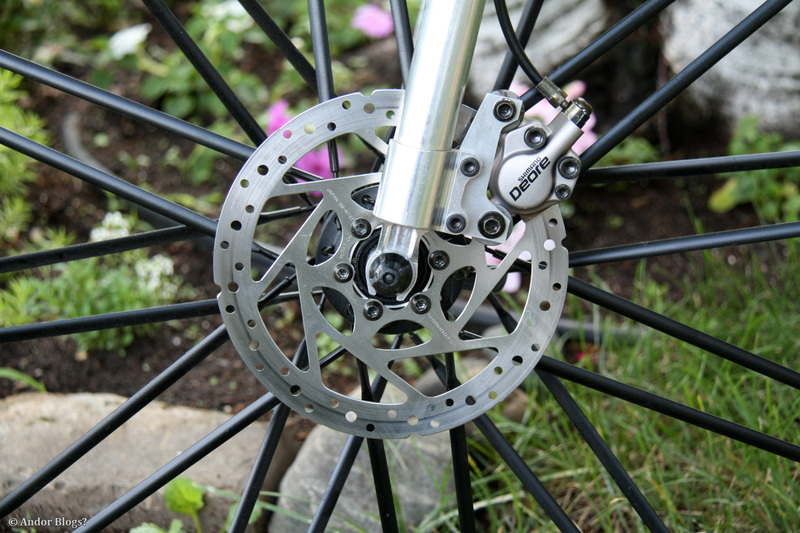 If I had not worked out a way to run them, I would have had to switch to some regular wheels and run the same lack lustre rear disk brake arrangement as on the police bike above. I really did not want to take the non-disk braking, carbon composite Spin Tri-Spokes off of this bike. They just look so great and if You haven’t connected the dots, just think, Mercedes-Benz logo, only they are the wheels. Yeah, I went there… Having rode this bike for 4 years with only front brakes, clamping on the mounts for the rear end was a nice feeling. So was the feeling of being able to stop really fast, without flying over the handlebars. Six years after getting the frame, the bike had reached what should be it’s final incarnation. I wish I could have fit a larger front gear, but the angle of the lower-rear fork will not allow more than the 48 tooth that’s on it. She rides like a champ, quite fast, easy to accelerate and it has a firm ride, but takes the edge off of those massive Minnesota pot holes.